Who needs Dracula or Frankenstein when you can scare the pants of people with a Japanese demon. 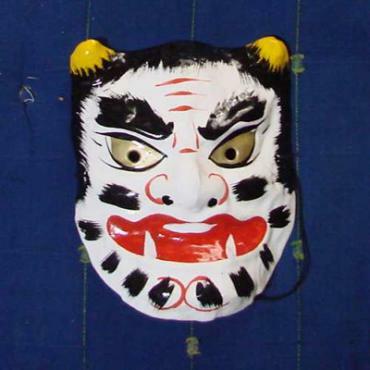 These handmade masks are designed in the style of traditional Kagura dance masks, and make great Halloween presents for children. Handmade and hand painted in a 10 stage process, using papier mache as the base. They can be mounted and hung as unique art decorations and souvenirs. In Japanese "shiro oni" means White Demon. This frightening demon mask is perfect for Halloween or to ward off evil spirits.